Boutonnieres are easy to make - but the line separating the amateur from the professional is the steps you take to ensure that the flower stays fresh for as long as possible. Always hydrate your roses immediately after receiving by cutting the stems under water that has been treated with a fresh flower food. 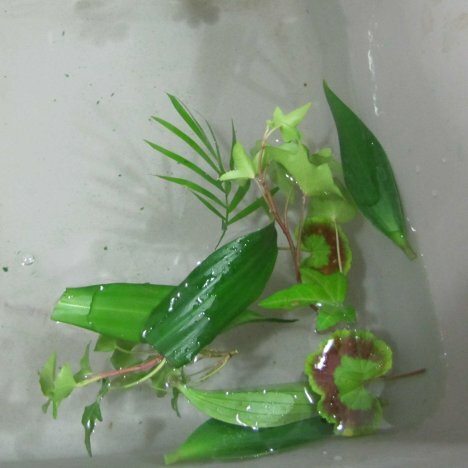 Stems cut out of water that are in dry stasis will gulp in air instead of liquid. This can cause an air bubble in the stem that blocks additional water from drawing up to the flower head. This is why you sometimes see a rose head drooping . . . likely is that the stems were cut out of water. Clean off the thorns and leaves and allow the flower to condition in a bucket of water for an hour or more before using. Remove any outer protective petals that appear bruised or discolored. 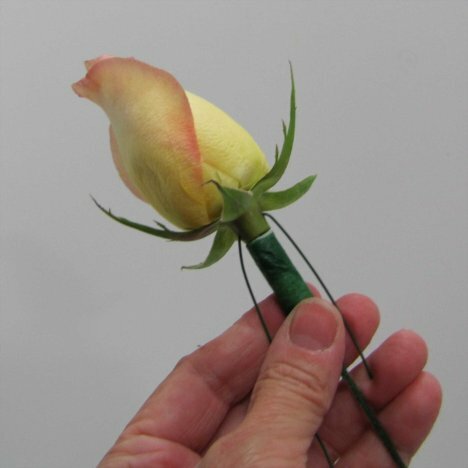 Wiring a boutonniere gives it additional strength and less likely hood of the head snapping off from the stem. 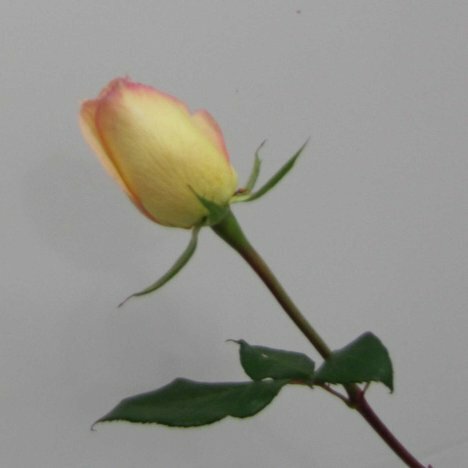 I pierce the short stem left on the rose directly under the head of the flower. 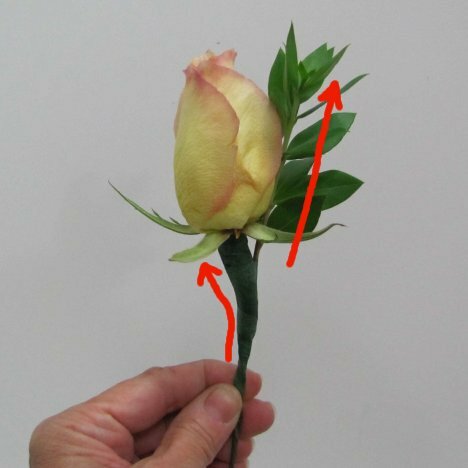 Bend the wire downwards so that it parallels on both sides the rose stem. 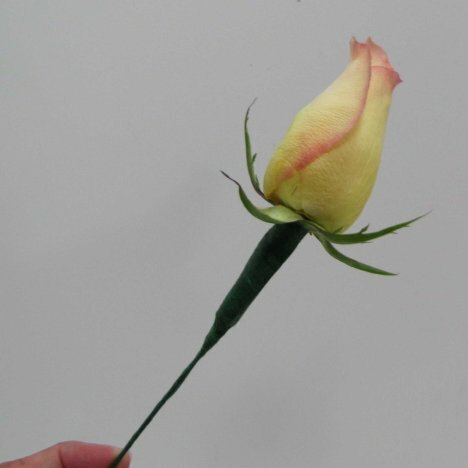 Use green stem wrap and wind it around the flower stem, starting high and directly under the rose head. Pull the tape around the stem so that it sticks to itself. 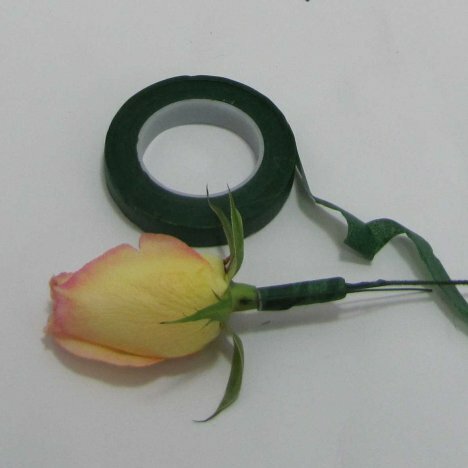 Wrap in a downward spiral, covering all of the rose pick down to the bottom for a smooth finished look. Making boutonnieres with an assortment of fresh greenery adds interest and texture to the design. You can use either mixed greens ordered from a bulk flower source or even snip leaves from household plants. Be sure to temper the leaves by soaking in a cool water. This ensures that the leaves won't droop and wilt quickly. 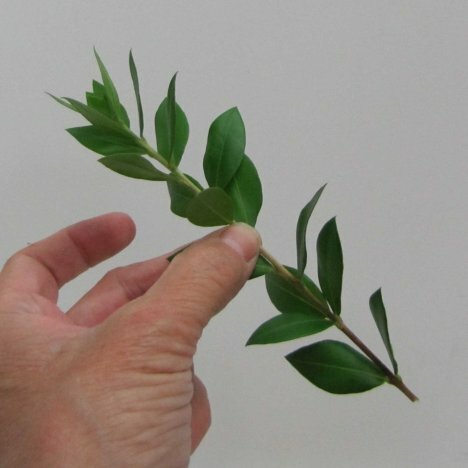 The leaves can be spritzed with Leafshine later that ensures that moisture is locked in and the leaves will look glossy and clean for the wedding. 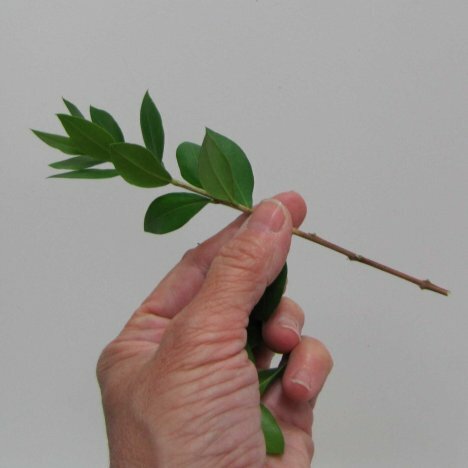 I begin by using a fresh lateral cut from a myrtle stem. Myrtle has a clean fresh scent when freshly cut and adds a nice touch to both boutonnieres and corsages. Strip the leaves off the bottom of the stem. The goal is to keep the lower stem slender and manageable without a lot of bulk. Place the greenery behind the rose head, edging slightly above the top of the flower. 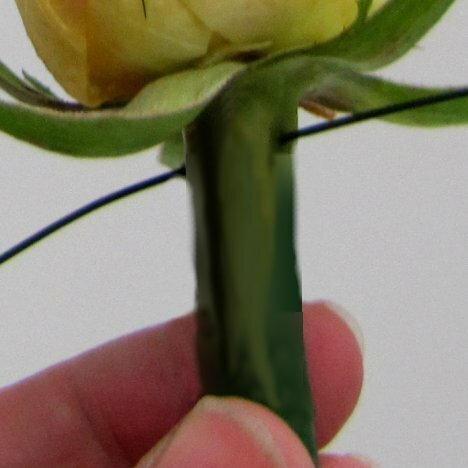 As you can see by a lateral view, I've bent the flower slightly forward so that the greens can maintain a straight upward position when pinned to the tux lapel. 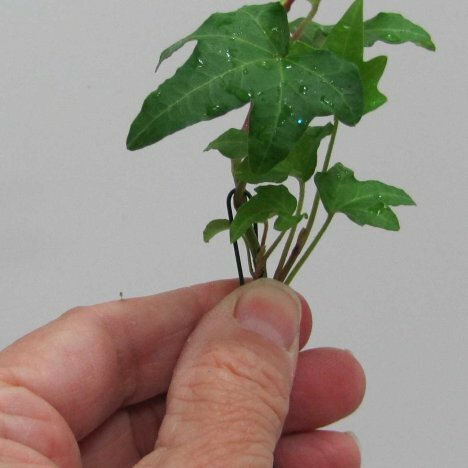 I love the look of fresh ivy when making a boutonniere. 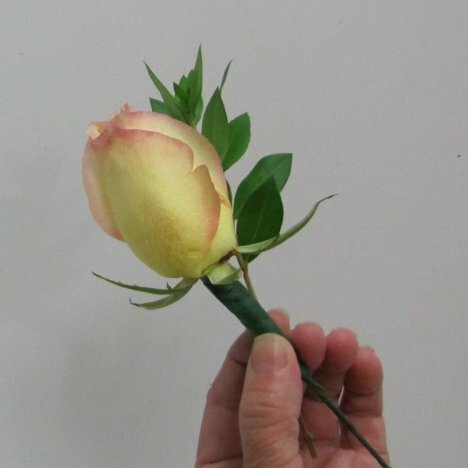 Choose the smaller, daintier leaves that are proportionate to the size of the flower head. 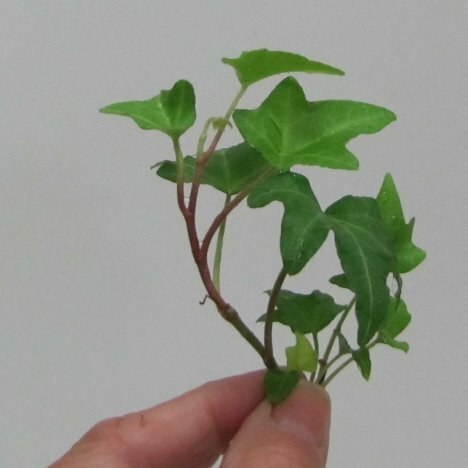 You can tape the stems of the ivy directly to the corsage, but - again - I like the control that wiring each stem of greenery gives me. It only takes a few seconds and a bit of corsage tape. 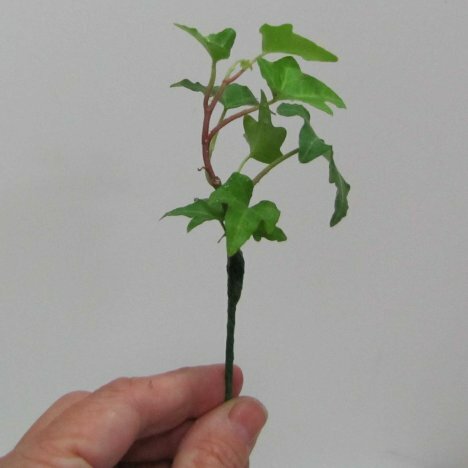 Hook the wire into a hairpin shape and pull down over a lateral of the ivy and then tape securely. 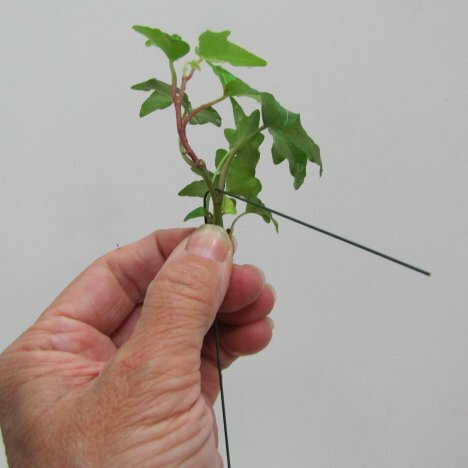 Now the stem is slender, easy to manage and can be bent to go in the direction you want. 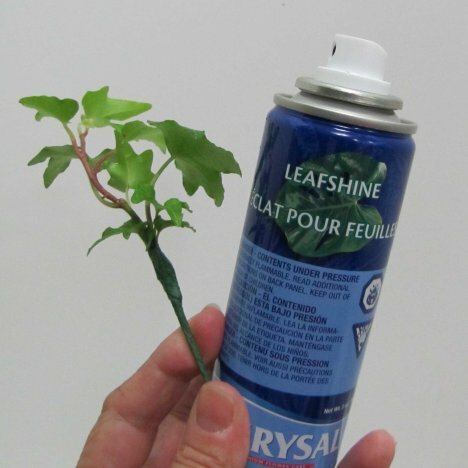 Leafshine is a product used by professional florists to seal greenery and plants. It seals the greens, cleans up any spotty residue left by the flower bath and helps keep the leaves fresh.